The appetite for stories and pictures about Mt. Everest never seems to diminish. This week the new movie Everest hits theaters, with an A-list cast and IMAX-worthy cinematography examining the famous 1996 disaster that became the basis for Jon Krakauer’s classic book, Into Thin Air. Of course, living in the Prairie State makes alpine climbing a bit of nonstarter. Illinois is the second flattest state in the country, behind only Florida. You not only don’t have to worry about altitude sickness when climbing in Illinois, you don’t even have to worry about a cramp. But that’s not to say there is nothing to climb in Illinois. No one will make an IMAX movie out of our adventures in Prairie State climbing, but you might just get a funny YouTube video out of it. While alpine climbers spend hundreds of thousands of dollars to climb the 7 summits—the seven highest summits on the seven continents—you won’t have to spend much at all to tackle Illinois’s 7 summits. You may, however, get in a pretty good workout and end up with a view that you puts Florida to shame. And no supplemental oxygen is necessary. 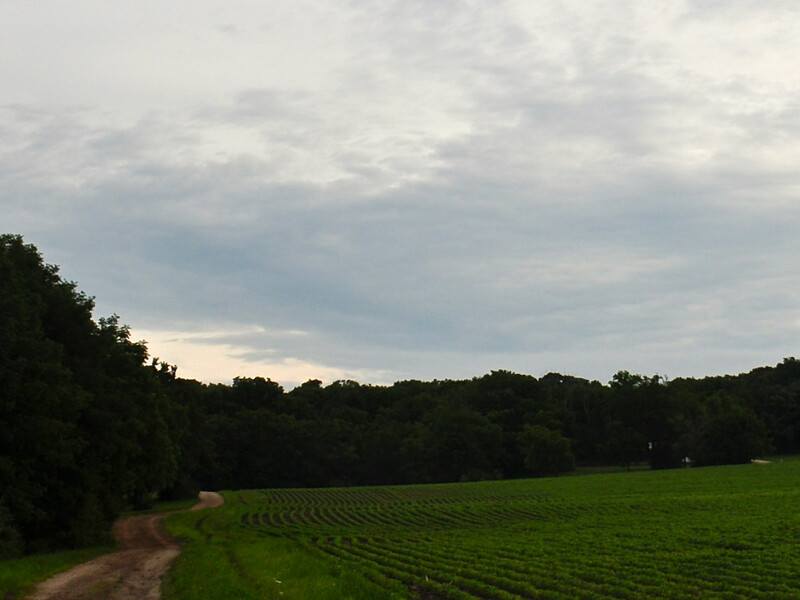 It is appropriate that the tallest point in Illinois isn’t even a hill, but a mound. But at 1,225 feet above sea level, it ranks 45 th in terms of highest natural state points. Really the only reason for anyone to visit Charles Mound, which is on private property in northwestern Illinois near Galena, is if you’re trying to summit the highest point in all 50 states, which is something at least a handful of people try to do each year. But if you’re interested in bagging the top point in Illinois, the landowners welcome climbers on the first weekends of June, July, August and September each year. The toughest part of the climb is actually walking from the gravel road where park, about a mile away. If you’re just looking for some hill workouts, you really can’t beat Galena, which will surprise anyone who hasn’t visited the northwest part of the state. The area offers excellent cycling for those looking for a challenge, and the annual Galena Triathlon and Duathlon offers probably the biggest climbs in the area on both the bike and run. The swim is, of course, flat. 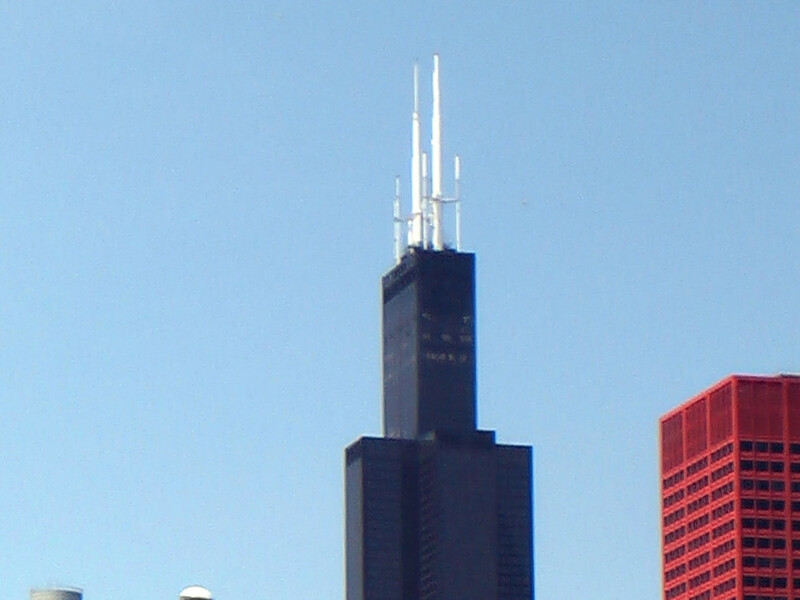 The highest point in Illinois is actually the Willis, formerly Sears, Tower in downtown Chicago. The building rises 1,450 feet above the ground, and 2,033 feet above sea level. The observation Skydeck is actually open 365 days a year if you’d like to take the elevator up and get some pretty impressive views of the city and Lake Michigan. But where’s the fun in that? The annual Skyrise Chicago is the world’s tallest stair climb, allowing participants to climb up all 103 floors to the top of the tallest building in the city. The winners finish in as quickly as 13 minutes, but most people require closer to 45 minutes to get to the top. This year’s event is on November 8. The Swallow Cliff Woods Forest Preserve southwest of Chicago was known for many years as the home of the most heart-pounding toboggan run in the area. Unfortunately, the Cook County Forest Preserve decided to get rid of all the runs due to the cost of maintenance—and I’m sure the lawyers didn’t like them. So while you can no longer enjoy a speedy ride down, the limestone stairs build on the side of the hill built in 1930 by the Civilian Conservation Corps are still there, and a very popular spot for stair-climbing workouts. You can also connect to other trails in the Palos Trial System that run through neighboring preserves for one of the hilliest trail runs in the state. Adding a climb up the stairs after a long run would even put Rocky to shame. What Illinois hills may lack in height, they make up for in character. And, in many cases, we made them ourselves. That’s the case of Mount Trashmore, the man-made hill in James Park in Evanston that has become a popular spot for runners looking for a hill workout in the pancake-flat suburb along the Lakefront. As the name suggests, the site is a former landfill that was turned into park space. In the 1970s, a tow rope was installed for skiing, but that’s long gone. Even sledding has been deemed too dangerous and banned on the hill by Evanston. But it’s still worth a climb in the warmer months, and you get a pretty good view of the city. This is another case of turning trash into treasure. 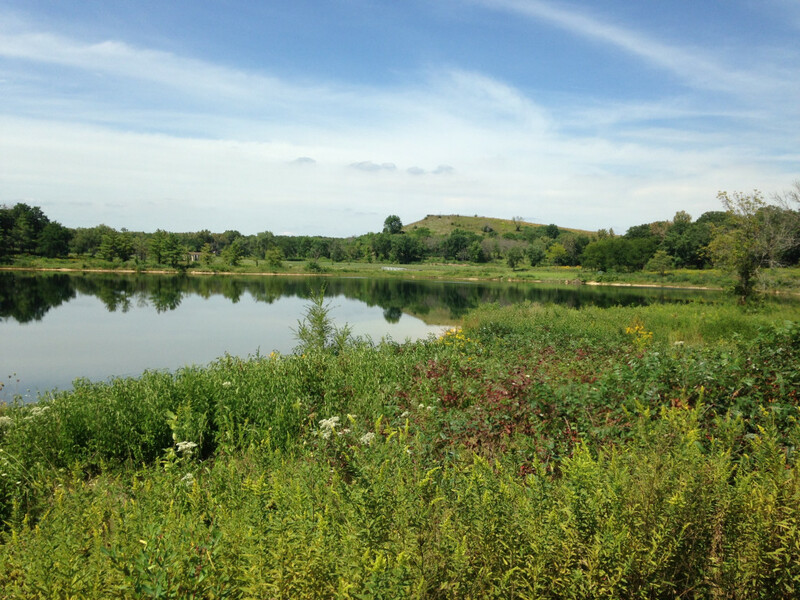 This Blackwell Forest Preserve in DuPage County just west of Wheaton was a former quarry, which eventually became Silver Lake in the 1960s. The adjacent property was used for a county landfill from 1965 to 1973, and was eventually turned into Mt. Hoy and added to the preserve. 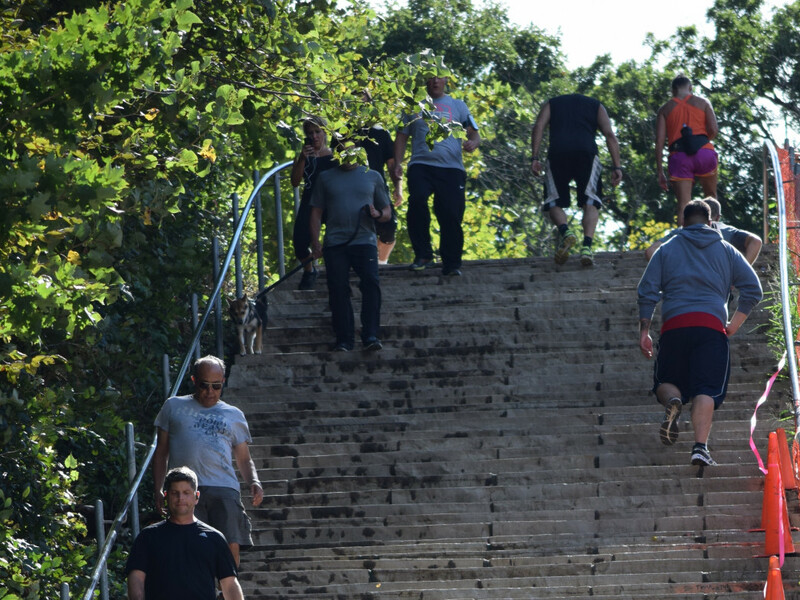 Runners looking for a hill workout in the western suburbs won’t find anything better than this climb. In the winter, the DuPage County Forest Preserve rents tubes to use on the hill, which offers a fun ride, but you’ll have to climb back up yourself. 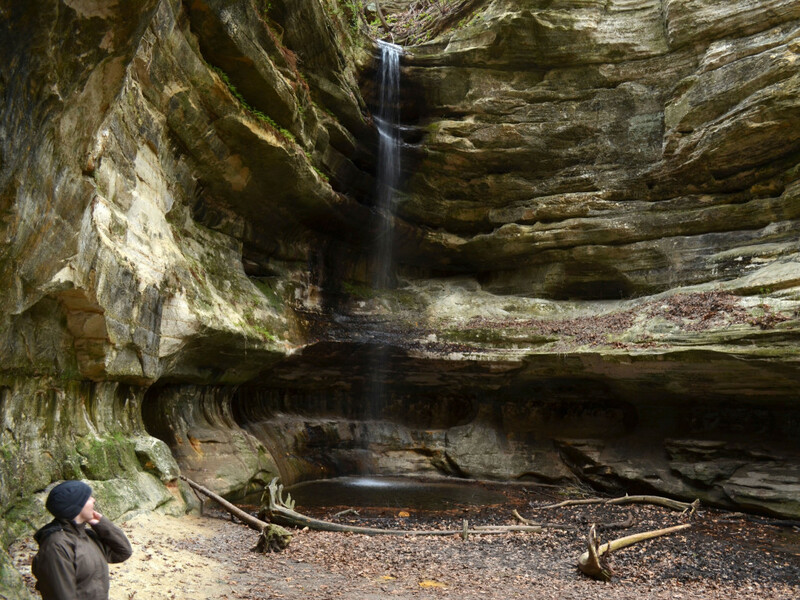 The most popular state park in Illinois, Starved Rock features several bluffs to climb that offer a spectacular view of the Illinois River below. You can also hike through the 18 canyons in the park, which feature impressive waterfalls during the wet season or after a rain. 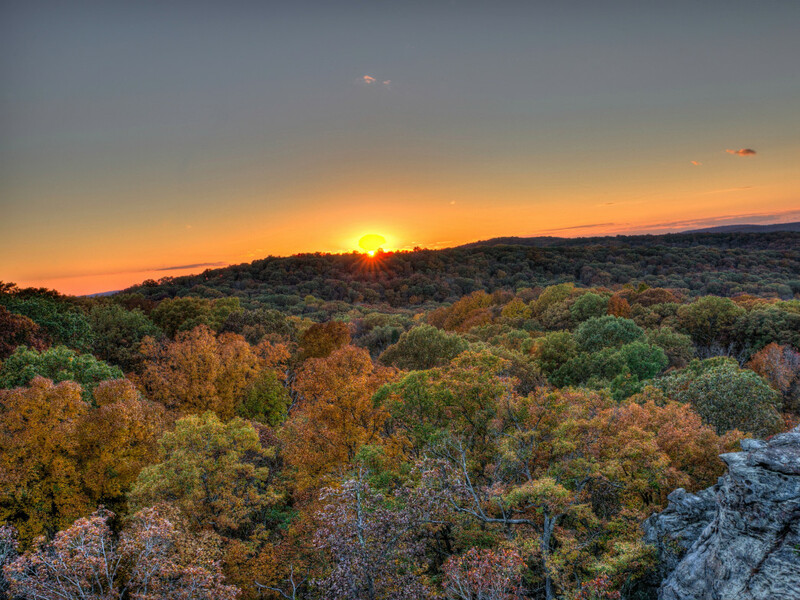 The high point is Starved Rock itself, a 125-foot sandstone butte. The name comes from an Illiniwek legend about a band of the tribe who starved to death on the rock while surrounded by the Ottawa and Potawatomi. As for the climb itself, you’re looking at a lot of wooden stairs and railings to make your way to the top. And it’s usually crowded with people. But if you want more of a natural experience, take the trails away from the parking lot and explore the canyons in the park. The farther you get from the parking lot, the fewer people you’ll see. You’ll have to drive quite a way for the final summit on the list, but you will get a chance to do some of the only legitimate climbing in the state. 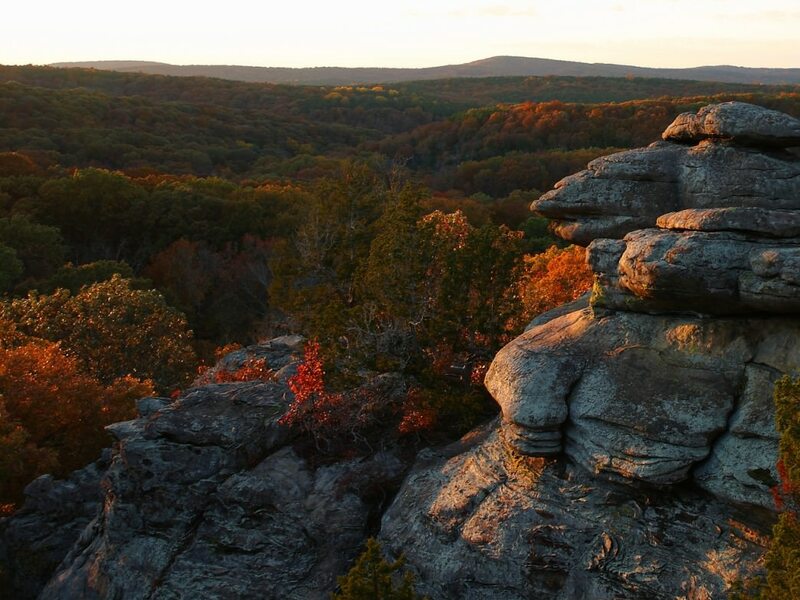 The Shawnee National Forest sits on more than 280,000 acres on the southern tip of the state. The highlight in the park for those looking to get up high is the Garden of the Gods, which is what’s called an uplifted sandstone plateau by geologists. Glaciers never reached this far south to level the terrain. So we’re blessed with these outcropping of rock that look as though precariously put together by, well, I guess gods if we’re to believe the name. It’s not surprising that Garden of the Gods is the most visited site in the national forest. But there are also more than 403 miles of equestrian and hiking trails to explore, including the River to River Trail, a 160-mile route that will take you from Battery Rock on the Ohio River to Devil’s Backbone Park on the Mississippi River.